If you ask me, and by reading this you kind of did, I think fruit beers get a bad rep (and a bad rap?). People think that men should drink “real” beer styles, and fruit beers should be left for the girls. I’ve always been of the mindset that if something is good, then I’ll drink it. Hell, I’ll even throw an orange slice into my Blue Moon because it enhances the drinking experience that much. R.J. Rockers has to deal with this prejudice every day with their brew Son of a Peach, and if you look at the mean-muggin’ peach on the label, you might think that they’re trying to overcompensate. 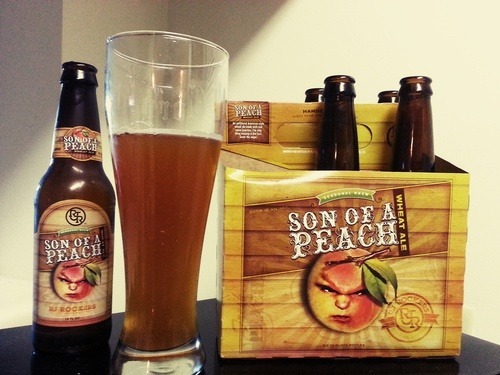 Son of a Peach is described as “An unfiltered American wheat ale made with real mean peaches. The only thing missing is the fuzz.” The description then goes on to say, “Savor the anger.” I get it, R.J., I get it, this is a manly, angry peach beer. Grrrr! You know, someday I’m going to get some good back drops for my photos, but I like to take pictures of what I drink (as opposed to a photo online) because it gives you the experience I got. Son of a Peach poured a beautiful, cloudy, deep-copper color with chunks of yeast floating throughout. I could have avoided the unnecessary, unfiltered yeast, but I feel that if it is in the bottle it should be in my glass. I’m a bit disappointed in the head of this beer. I noticed part way through my pour that there was not going to be much froth, so I tried to pour more vigorously to no avail. Wheat beers are supposed to be highly carbonated with a good, fluffy head. Son of a Peach had almost no head. Wow. I know that sounds overly dramatic and doesn’t tell you everything, but my first thought is simply, “Wow!” It’s as if I am smelling a can of peaches. You know, the peaches in a can you got as a kid that are sitting in their own syrup. The kind that you chop up for a juicy Dole-style fruit cup for your sack lunch. The smell is saccharine peach with almost no aroma of hops or malts at all. Son of a peach is thin in the mouth. It has tiny bubbles that coat your tongue with effervescence, but by no means is this a chewy beer. I could see myself drinking many of these in the summer time, just trying to stay “hydrated”. If you like peach pie, you’ll love this beer. The first thing I taste is a huge kick of fresh peaches, followed by biscuity malts and wheaty breadiness. It is smooth and sweet, but not overly sweet. Sometimes a fruit beer leaves you satisfied like a decadent dessert, but this has just enough sweetness that you’ll be fine if you order another one, or two. There is a slight hop presence — about as much as you would find in a Blue Moon, 312, or any other American wheat beer. The aftertaste is slightly unpleasant. It’s not bitter, or skunky, but it kind of has a cardboard-like aftertaste. It’s not too strong, but it is noticeable. So will Son of a Peach win everyone over and make the hard-core beer drinkers appreciate a fruit beer? Probably not. But it is a very solid choice for someone who is looking to try something new, and doesn’t mind a little sweetness to their beer. I have to give SoaP an 4.3/5, or a B. While the aroma is intoxicating, and the flavor is pretty good, it just doesn’t hit me as a great beer. I would love to see more carbonation, a little more body, and a better aftertaste. For a while, I was really high on this beer. Last summer I was passing over other distinguished brews for Son of a Peach on a regular basis. It is a drinkable beer that adds a little flavor to a world of hops and malts. It serves as a great “dessert beer”, and fits in perfectly at a family Barbecue.